Dennis and Barb Johnson came up for a visit on Wednesday afternoon with enough salmon to choke a horse. We all did our best to eat as much of it as we possibly could, Jim and I especially. We had a fabulous visit after not seeing them since leaving Florida this past spring. The good news is that we’ll all be getting together on the west coast this coming winter, Arizona way most likely. 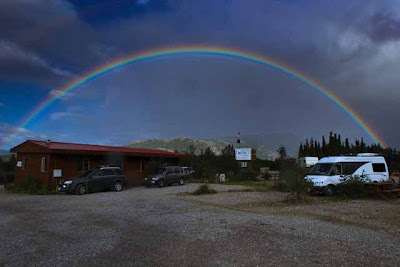 While they were visiting it began to rain and the double ended rainbow you see here formed over the campground out our front window. Amazing!! 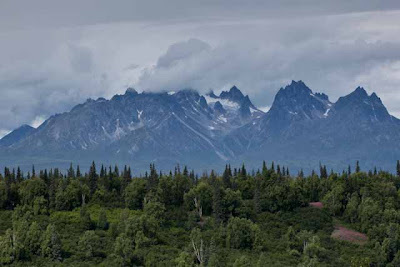 We left Denali RV Park and Motel on Thursday morning and had a very scenic drive on our way south to Wasilla. We were hoping to see a nice south view of Mt McKinley but unfortunately the weather did not cooperate and the upper third of the mountain was obscured by clouds. We pulled into Big Bear RV Park in Wasilla at 3 pm. Jane and I went in to register and thanks to Jane’s negotiation skills again, we are getting a week here for only $160. No sewer site for either of us until Sunday though, but that is okay. Today, we took a run into Anchorage in the Vue. I managed to get my glasses fixed at Lenscrafters and then we took a stroll through the market off D street. The girls also picked up some nice souvenirs at the Ulu Factory. Still having trouble with iCoach but they are looking into it. My compass modem isn’t able to log on here, so the same trouble we have been experiencing since we left Grande Prairie at the beginning of July. I’ve given them until the end of this month to fix it or else……. 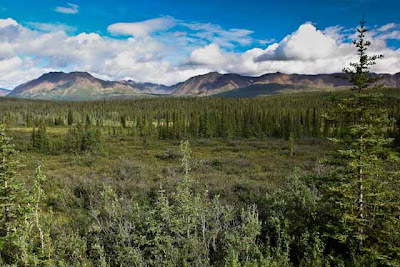 This entry was posted in Alaska, Campgrounds, Photography. The Rainbow is an incredibly beautiful picture.